Performance’s only life is in the present … ιt can be performed again, but this repetition itself marks it as different. Artist and dancer Florencia Guerberof revisits the same themes with repeated performances. As she explains, in the new, extended version of her performance Mi patria Son Mis Zapatos (my homeland is in my shoes), at the Blue Elephant theatre, “the conflict of a nomad existence is resolved by finding a permanent residence in one’s own footwear”. Her shoes, the ground, percussion sounds, are all elements through which her body constructs an anxious, energetic performance in space. The performance questions the idea of origin as a human need for belonging – having symbolic roots perhaps tied to the ground or to the soil, in contrast with a cosmopolitan or nomadic existence – its extreme being a home country represented by the individual’s own shoes. The shoes being transportable and interlocked with the human body, a host and a carrier, a home or a shell – a relationship of body with shoe, of gravity with ground; shoes as a piece of ownership, a concept increasingly denied to the ground – the ground being a base, earthy, solid and static. Within the concept of nomadism, shoes become the symbol of travel and independence, but also of rootlessness. In the performance the concept of origin, of belonging becomes ambiguous and disentangled from the ground. The cosmopolitan/nomad having an existential outlook to life, has no country, does not belong and cannot be tied down – nomadic style of life creating a kind of alienation, indifference, a neither here nor there. As Braidotti argues the nomad is “the kind of subject who has relinquished all idea, desire, or nostalgia for fixity”. The nomadic subject, a post-modern multi-persona, is simply “post-identitarian”. Thus the nomad does not stand for homelessness, exile, compulsive displacement or forced migration. The opposite artistic gesture being the 1992 Art in Ruins’ fixed installation titled Conceptual Debt, with the caption My homeland is not a suitcase. Performances such as Guerberof’s, which highlight the nomadic subject, correspond to long-standing theoretical activism coming from the margins with debates on cosmopolitanism and displacement, immigration and Diaspora, globalization and transnationalism, which have given voice and rights to whatever is considered as “other ” with particular influence on the European integration project. Guerberof states that the ground is a surface “from where all things originate and from which we take life and energy”. Back to the performance, there is a moment when Guerberof, dressed in earth colours, lies flat on the ground, as if transforming to an Ana Mendieta’s earth work image, but then opposing Mendieta’s insistence on creating borders with her own body, she stands up to continue her dancing conflict with her shoes. 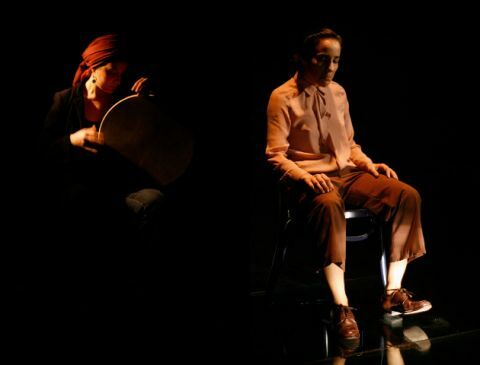 During the performance as Guerberof tries continuously to take off her shoes, the connecting link of body to ground or any kind of fixity are all denied. It seems as if gravity needs to be defied and exchanged with a lighter, faster form or condition. 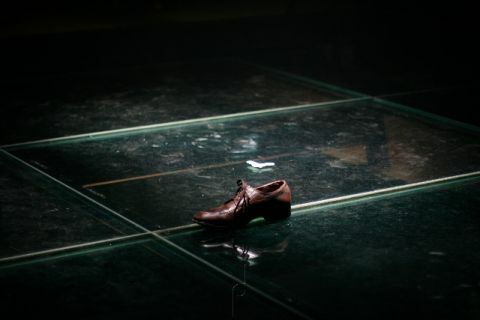 In the performance it is the shoe, the “patria”, that becomes a burden, which needs to either be carried along as an accessory to the body in transit, or simply left behind. Hinged to theory, the work is thoughtful and imaginative.